Overview: In 1963, Stan Lee, Jack Kirby, and Steve Ditko were reaching new heights with their comic creativity. In that year alone, Marvel Comics introduced Spider-Man, Iron Man, Doctor Strange, the Avengers, and the Uncanny X-Men. That last title featured a group of teenagers with mutant abilities that set them apart from the rest of humanity as freaks. Professor Charles Xavier enrolled these kids into his private school. In addition to normal school studies, the teenagers learned to use their abilities and talents for the good of mankind. Wearing matching uniforms, these teens were named the X-Men, and from these humble beginnings would grow a legendary saga. The original X-Men (Cyclops, Marvel Girl, Angel, Beast, and Iceman) would remain the core line-up throughout the 1960s. In the very first issue, the team faced off against Magneto, who would threaten the teens and the world over and over in the first two years of the book. In issue #4, Magneto brought in a Brotherhood of Evil Mutants — Mastermind, Toad, Quicksilver, and the Scarlet Witch — to go one-on-one with the X-Men. (Quicksilver and Scarlet Witch would later reform and leave this team to join up with the Avengers.) We saw the introduction of Charles Xavier’s stepbrother, the rampaging Juggernaut, followed by the mutant-hunting Sentinels. What makes this Essential? : These are fun stories, but not great stories. The better line of X-Men stories came a decade later, which have been collected in Essential X-Men Vol. 1 and subsequent volumes. With these issues, all of the key parts to the X-Men mythos are introduced, but it took the next generation of writers and artists to propel the X-Men franchise to the stars. If you are a fan of the X-Men, this should be in your collection. Footnotes: This volume was first published as Essential Uncanny X-Men Vol. 1. When it was time to release the next book, Marvel renamed the title to Essential Classic X-Men Vol. 2 (and later Vol. 3). Subsequent new printings of this book now show the title as Essential Classic X-Men Vol. 1. Despite the title changes, the contents remain the same in all editions of the first volume, X-Men #1-24. This entry was posted in Classic X-Men, Marvel Essentials and tagged Jack Kirby, Roy Thomas, Stan Lee, X-Men. Bookmark the permalink. 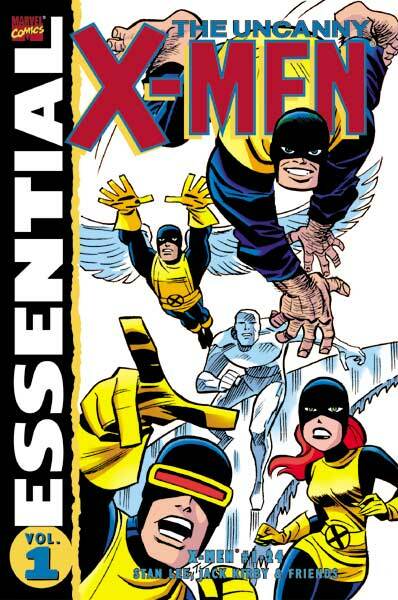 Pingback: Throwback Thursday – Essential Uncanny X-Men Vol. 1 | WORST. COMIC. PODCAST. EVER!